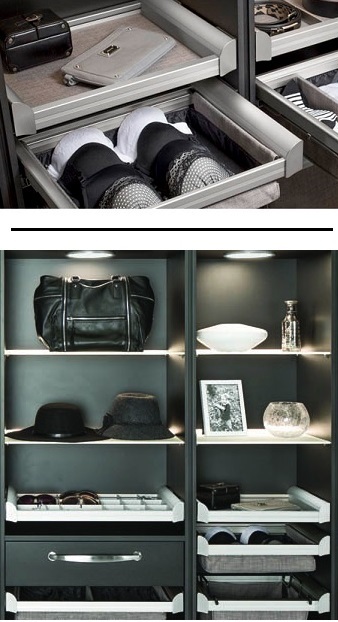 In today’s closet landscape, bland and utilitarian simply doesn’t cut it. People want high fashion and couture components to store and cradle their most fashionable things. Enter the ENGAGE closet and storage system. A new, modular storage system from Häfele America Co., a leader in organizational systems and furniture fittings, ENGAGE is designed to stylishly fit all of your storage needs. Crafted to work in any space—large, small, narrow or in-between—ENGAGE features aluminum frames and dividers in multiple finishes on under-mounted, full-extension slides that come standard with a soft close. Available components include a variety of color and finish matching storage boxes, jewelry organizers, folding stations, divided shelves, lingerie drawers, deeper drawers as well as shoe, pant and laundry hampers. All components in the ENGAGE closet and storage system are available in standard 18”, 24”, 30” and 36” widths. Drawer face adapters can be added to conceal frames and dividers while adding even more personality. Lastly, locks can even be added to secure jewelry and other valuables. Stocking finishes include Nickel Matt frames with Slate fabric or Oil-Rubbed Bronze with Beach fabric. As a bonus to closet installers, all ENGAGE pieces come ready-to-install right out of the box. That’s style and efficiency you cannot beat!